Wireless Vantage Pro2 with Standard Radiation Shield Includes Vantage Pro console/receiver, integrated sensor suite, and mounting hardware. 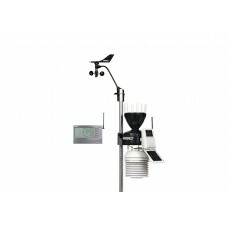 Integrated sensor suite includes rain collector, temperature and humidity sensors, anemometer, 40'(12 m) anemometer cable, and solar panel. Temperature and humidity sensors are enclosed in standard radiation shield. Sensor suite is solar powered. Transmitter and battery are located inside radiation shield. Console may be powered using the included AC-power adapter or with three C batteries (not included). Wireless range is up to 1000' (300 m) outdoors, line of sight. Typical range through walls under most conditions is 75' to 150' (23 to 46 m). Add wireless repeaters for distances up to 0.6 miles (1 km).